As I wrote Saturday, I received not one but two Toomey responses in the mail last week. In fact I received another in the mail after writing yesterday's blog post - so, there's one more on the way! 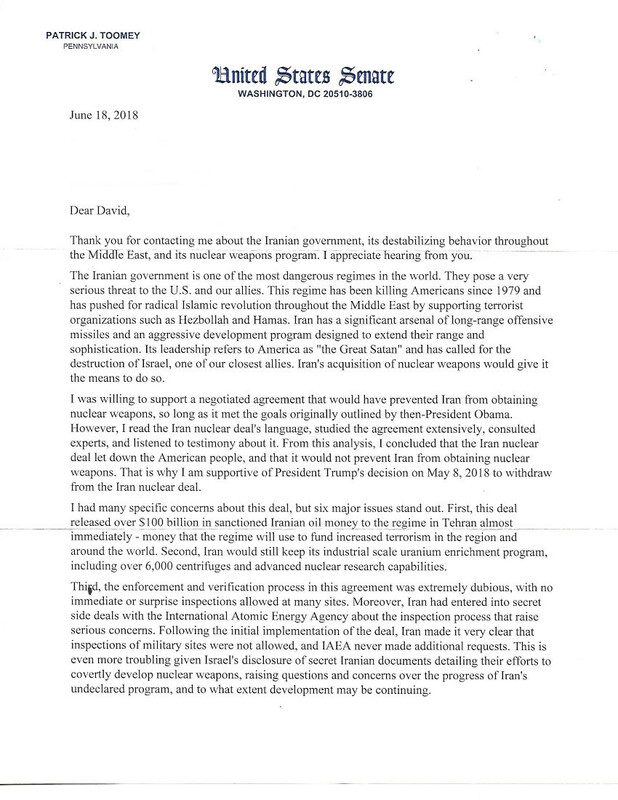 Thank you for contacting me about the Iranian government, its destabilizing behavior throughout the Middle East, and its nuclear weapons program. I appreciate hearing from you. In contrast to the letter I blogged on yesterday this one is easy. He's "responding" to (I can't say answer) this letter, the 61st. In addition to paving the way for Iran to develop nuclear weapons in a few short years, the JCPOA provided immediate sanctions relief and $100 billion to the world's leading state sponsor of terrorism. First, this deal released over $100 million in sanctioned Iranian oil money to the regime in Tehran almost immediately – money that the regime will use to fund increased terrorism in the region and around the world. Which is true but, again, lacking in the necessary context to fully explain where the money initially came from (Iran). Second, Iran would still keep its industrial scale uranium enrichment program, including over 6,000 centrifuges and advanced nuclear research capabilities. The agreement also calls for Iran to give up most of its centrifuges. Under the deal, Iran would go from having 20,000 centrifuges, which are used to enrich uranium, to having 6,104 for the next 10 years. Under the deal, Iran also agrees to give up its most advanced centrifuges and use only their oldest models. The deal allows Iran to continue doing just that at its Natanz facility, but the country would only be allowed to enrich uranium to no more than 3.67 percent, which is enough for civilian purposes such as power plants but is much lower than what's needed for a weapon. Under this deal, Iran could keep 300 kg — enriched at no more than 3.67 percent — for the next 15 years. More than likely, Iran will get rid of what it couldn't keep by shipping it to Russia. See how much of the truth Toomey left out? Toomey (or his office) simply fails to point out that the "industrial scale uranium enrichment program" mentioned would not be producing any uranium at an enrichment level necessary for nuclear weapons. And no plutonium at all. 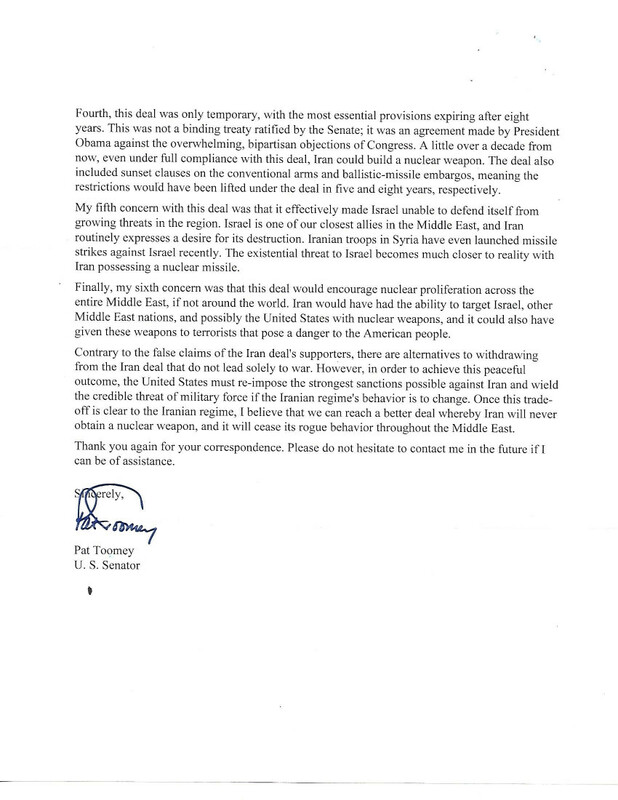 But it would still exist, allowing any uninformed reader of Toomey's letter to infer , incorrectly, that Iran would still be able to make the fuel necessary to make nuclear weapons. And Toomey simply fails to mention that the 6,000 centrifuges constitute a reduction of 14,000 from 20,000. 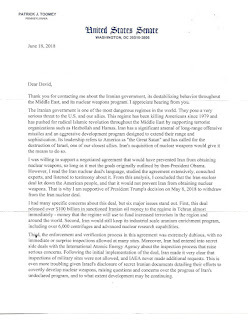 And he also fails to mention that the centrifuges that the deal would have allowed would only be Iran's oldest centrifuges. 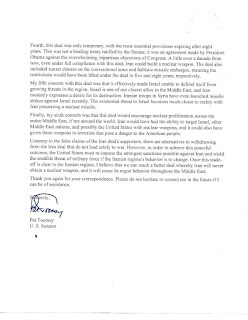 Sorry, Senator, but the money, the enrichment levels, the centrifuges - all dishonesty by omission. Obama Administration secretly sent Iran the money in the form of pallets of cash.